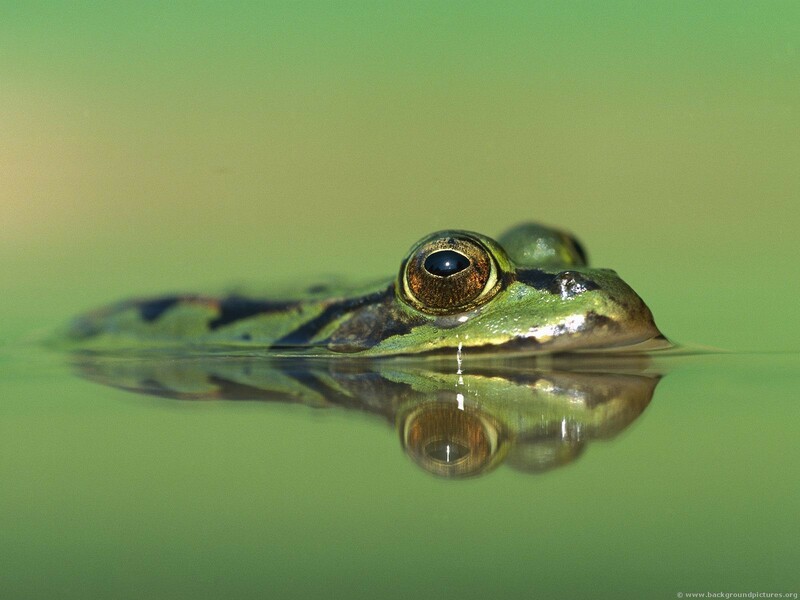 Animal Wildlife | Edible Frog | The edible frog is a species of frog found across Europe that is also known as the common water frog and the green frog. 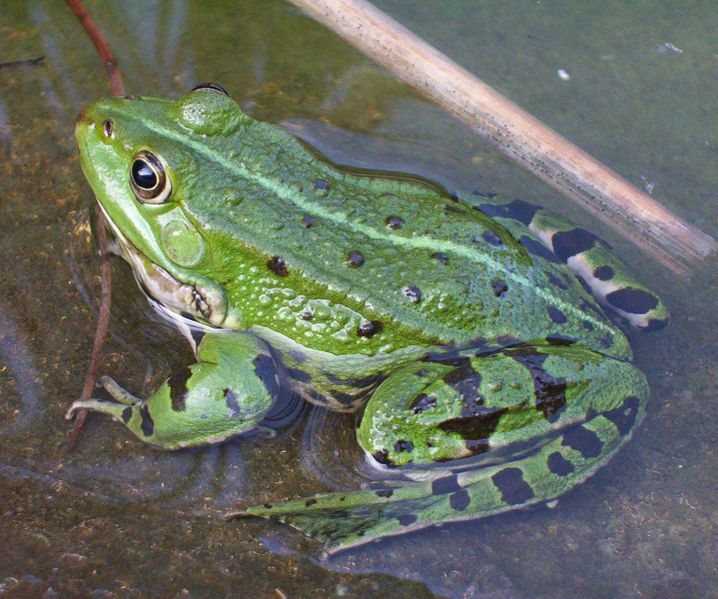 The edible frog is a fertile hybrid of two other European frogs, the pool frog and the marsh frog, that bred when populations where isolated close to one another during the ice ages. The scientific name of the edible frog means both "mud" and "guardian" as they are known to never stray far from water, almost guarding the muddy banks. It was first described in 1758 and has adopted it's name as the "edible" frog due to the fact that they are now seen as a culinary delicacy in France, particularly the legs. The breeding season for edible frogs begins during March and generally lasts for a couple of months. 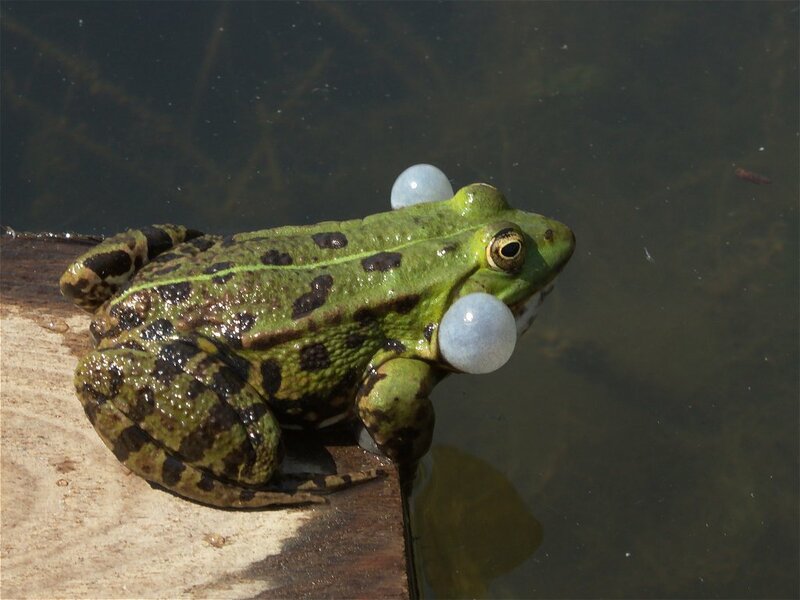 Males sing by drawing air in and out of their vocal sacs to produce the highest-pitched sound possible, as the female is most attracted to the loudest frog. 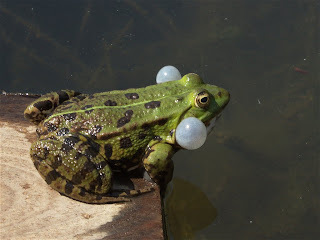 After courting her in a lake, pond or swamp, the male lets the female lay up to 10,000 eggs in a sticky mass into the water, before he fertilises them. 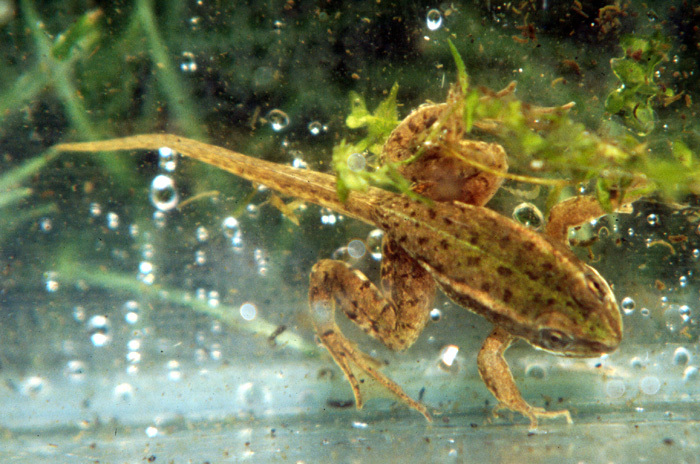 Tadpoles can be as small as 0.5cm long when they hatch and are a grey/brown colour, then growing up to 7cm in length before metamorphoses occurs, and they leave the water as 2cm long young frogs. Edible frogs reach sexual maturity at the age of two and can live until they are 15 years old. Adult edible frogs are carnivorous animals, surviving only by eating other animals. 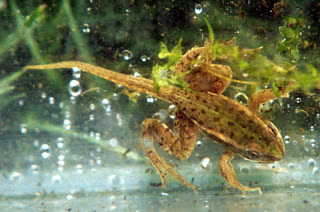 The tadpoles however, mainly eat vegetation although are known to supplement their diet with aquatic micro-organisms on occasion. Small invertebrates such as insects, spiders, moths and flies make up the majority of their diet along with larger aquatic animals like fish, newts and other frogs, and even small birds. Edible frogs hunt for their food during the day and can be seen catching food in ponds, and even on land. There are even reports of edible frogs venturing up to 500 meters away from water in their quest for nutrition. Edible frogs remain very still when they are guarding the muddy banks, and this along with their camouflage, makes them very difficult for predators to spot. Their eyes are positioned near the top of their heads meaning they can also see danger coming whilst their body is mainly hidden. Snakes, owls and water-dwelling birds are the main predators of the edible frog, along with humans who commonly eat them. 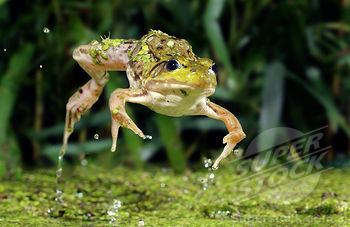 Edible frogs will jump into the water and hide if they sense approaching danger, and will make a loud screeching sound if caught. Edible frog populations are also under threat from habitat destruction mainly caused by deforestation and water pollution. The edible frog is one of the few animals in the world that is a fertile mix of two different species, as although similar but genetically different species are known to mate, it is very rare that their offspring will be able to breed. The kl. of the edible frog's scientific name indicates that the species is made up of chromosomes that have been stolen from other species. The esculentus part of the edible frog's scientific name is Latin for edible as this species is one of the most commonly eaten frog species in the world. Today, the edible frog is listed as a species that is of Least Concern from extinction in the near future, but populations in certain areas are declining. They are particularly adaptable animals and have been able to inhabit man-made bodies of water. Providing however, that the water quality is good, there is an ample supply of food and little competition for it from other species. 0 Response to "Edible Frog"